On July 11, 1970, the United States Air Force launched an ATHENA V-123-D rocket from Green River Launch Complex in Utah. While its intended target was the White Sands Missile Range in New Mexico, it impacted “180-200 miles south of the Mexican border,” according to a recently released memorandum sent from the desk of Henry Kissinger, then serving as National Security Advisor to President Nixon. The document cites “abnormal re-entry into the atmosphere” as the reason why the rocket landed in the Mapimi desert, a “sparsely populated” area in the Northeast corner of the state of Durango. 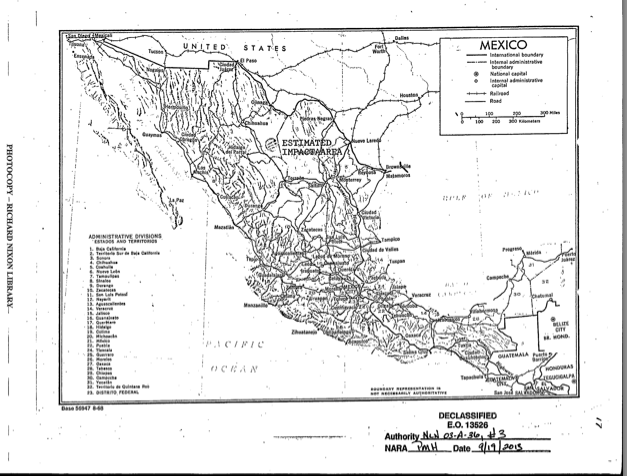 While the three-paragraph memorandum may seem as though the mishap was nothing to be concerned about (noting the Mexican Government’s “willingness to grant clearance and assist in any search efforts”), the cleanup effort was long, costly, and included the construction of a road through the Mapimi desert to excavate hundreds of tons of soil from the impact site. The scale of the cleanup was due to the fact that the rocket was carrying two small vials of cobalt 57, an isotope used to enhance radioactive fallout with the intention of contaminating large areas of land (commonly referred to as a “salted bomb”). According to a 1971 report from the Office of Air Force History, the ATHENA rocket tests at Green River were part of the Advanced Ballistic Reentry System (ABRES) program. The program “developed and tested promising reentry vehicles and penetration aid devices for use on present and future ballistic missile systems.” While the Atlas test flights under the same program “gathered valuable reentry vehicle performance data” that contributed to the development of multiple independently targetable reentry vehicles (MIRV), the Athena launch program was “suspended in July 1968 after three consecutive flight failures.” But the report notes that after its reactivation in November of the same year, the program yielded “thirteen successful Athena launches” that “carried a variety of payloads” and aided the development of “reentry vehicles [that] altered their ballistic paths upon command.“ But despite these advances, “ABRES program funding dropped from $147.7 million to $105 million” between 1966 and 1969, which forced the Air Force “to postpone development of the improved Athena H booster.” Since MIRV research and development was the program’s main concern at this time, “test range operations—deeply cut in fiscal year 1970…would have to be slashed even more than before.” Combined with the Athena program’s flight record prior to the 1970 test range budget cuts, the ATHENA rocket misfire that occurred at Green River on July 11th of the same year doesn’t seem like as much of an unexpected anomaly as Kissinger’s memorandum to President Nixon makes it sound. Several months later, an Air Force General responded to claims of political and safety concerns by noting that “system reliability can no longer be considered a limiting factor” to rigorous ICBM testing. 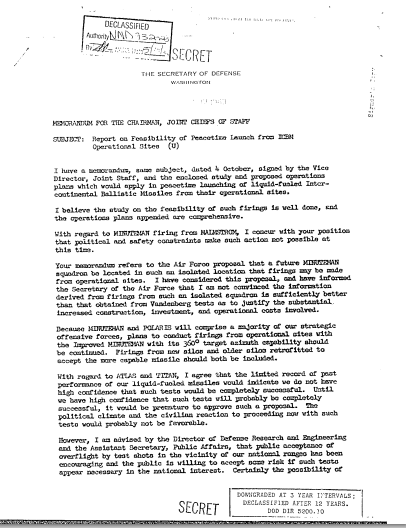 But within a matter of days, another Air Force memorandum reiterated that the “concern of possible international and political implications” resulting from overflight “remain[ed] as the major constraint against launching Minuteman missiles from existing operational sites at [the] time.” While this may seem like an unnecessary concern if the Air Force were to take proper precautions in the construction of its launch sites and testing ranges, the description of an overflight make the author’s fears seem well warranted. In reference to the launching of Minuteman missiles from Malstrom Air Force Base in Montana, he notes that “examination of the planned flight profile indicated first stage impact just short of the Canadian border; second stage in the Hudson Bay; with re-entry vehicle impact in the North Atlantic area off the coast of Greenland. Since a malfunction similar to the failure of thrust termination control experienced on the first Minuteman Operational Test launch could result in overflight of Canada and Western Europe with flight termination in Africa, the political aspect [is] of much greater concern.” Clearly, this was a scenario worth being concerned about, which is why these tests were eventually fired from Vandenberg Air Force Base in Lompoc, California. Soviet Capabilities for Strategic Attack. At the very least, these internal Air Force communications beg the question of why so many ICBM tests were conducted with insufficient funding after their safety and political concerns were made so abundantly clear. 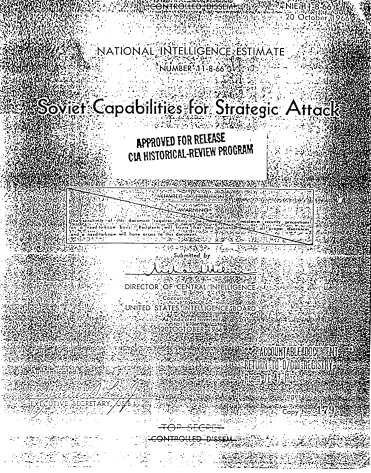 A National Intelligence Estimate of the USSR’s nuclear arsenal, signed by former CIA Director Richard Helms on October 20, 1966, sheds a fair bit of light on why military strategists were so anxious to begin ICBM testing despite multiple experts advising that overflight was a real and legitimate concern. Their urgency was fueled by protracted concerns of the Soviet Union matching the United States’ nuclear force. The 1966 CIA report voiced concerns that not only would the USSR “have reached approximate numerical parity with the currently scheduled US force of ground-based ICBM launchers” by 1971, but that this quantitative parity would allow the Soviets to develop a nuclear arsenal that would be qualitatively superior.1 In this frame of mind, the deployment of “multiple, independently-guided re-entry vehicles (MIRV) and other suborbital or fractional-orbital long-range ICBMs” that boast “a considerable improvement…in re-entry technology” seemed not only inevitable, but swiftly approaching.2 This explanation may seem like somewhat of an oversimplification, but the 131 ATHENA rocket test flights launched from Green River between February 4, 1964, and September 17, 1971, stand as an undeniable testament to the lengths that American policy makers and military strategists were willing to go to maintain a nuclear advantage over the Soviet Union. The fact that these launches happened despite multiple test failures, a dwindling budget, and the looming possibility of an international political incident is further confirmation of the extent to which nuclear force parity had become central to American foreign policy by the beginning of the 1970’s. While it could easily be written off as a military and scientific blunder, the ATHENA V-123-D launch on July 11, 1970, has a very rich back story that has a lot to teach us about the ways in which genuine diplomatic, security, and logisitical concerns can be swept under the rug in the face of myopic policymaking. In this sense, it seems almost fitting that the area of the Mapimi desert that was impacted by the rocket has become much less a symbol of the Cold War arms race than it is a magnet for paranormal and extraterrestrial folklore. Commonly referred to as the Mapimi Silent Zone, locals have latched on to the legends of radio silence and alien sightings as a means to boost tourism in an area that would have had none otherwise. 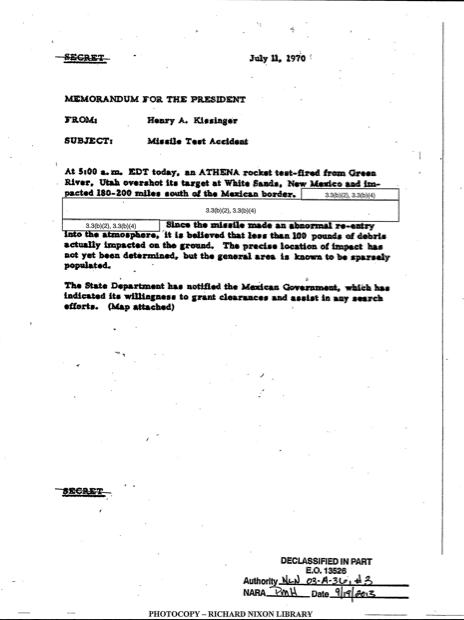 While it is referenced in several news articles and Wikipedia entries, the ATHENA misfire that occurred on July 1970 rarely outshines the reports of UFO’s and paranormal activity that it provides a scandalous backstory for.